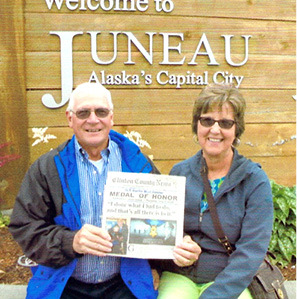 The Clinton County News traveled to Alaska recently, enjoying an 11 day cruise with Bro. Bob anb Peggy Sawyer. During one stop, the group visited Juneau, Alaska, the Capital City of our nation’s 49th state. Going on a trip? Take the Clinton County News along and make a photo and we’ll publish it in the newspaper. Send the photo in its full resolution jpg format, attached to an email to: gpcompany@kih.net.